File this one under the “Finally” category. 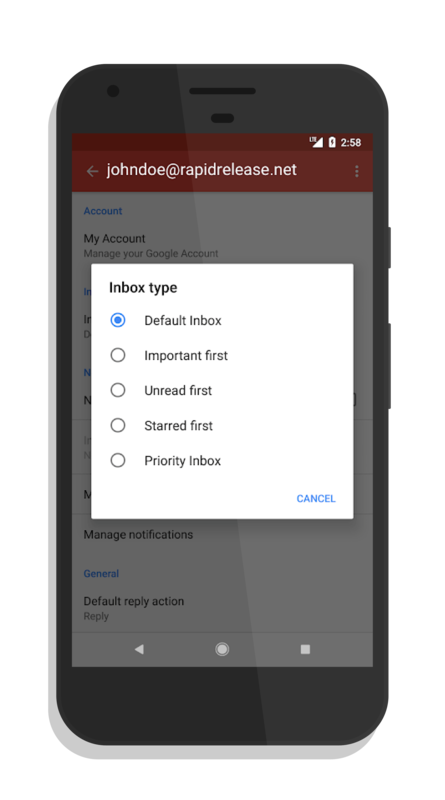 Gmail for Android is finally getting inbox type sorting. The ability to filter your inbox based on a number of criteria has been available on the web and in the iOS version of the app but had never made it into the Android build. That is changing with an update to the Gmail rolling out over the course of the next week or so to bring the feature to users. What is inbox type support? When available, you will be able to sort your inbox on a number of criteria including unread messages, important messages, stared messages and priority inbox. When you enable one of these, that message type is bubbled up to the top of your Gmail view on your phone so you can deal with them first. The most common use is unread messages so you would see all of them first, then your read messages below it. To further enhance the feature, if you have a inbox type setup the web version, that will sync to your phone version (and vise versa) so you will always have the same view no matter the device you happen to be using at the time. The feature is rolling out to all users and it will take up to 15 days to be available for everyone. It isn’t 100% clear if this new feature will require an app update but that is likely the case along with the cloud-side change to enable it. Bottom line is keep your eyes open for a Gmail update over the next week or two and then you can start managing your inbox the way that works best for you.